Today’s behavioral economics podcast is about availability. This is another foundational episode that ties in to last week’s episode about scarcity. Similar to the bond between anchoring & adjustment and relativity, scarcity and availability can often be found together. There is also a free worksheet available for download that will help you apply today’s concept in your business. What do sharks, cows, toilets, buckets, and air fresheners have in common? They are part of the interesting concept of availability. Our brains get lazy and decide the likeness of something happening is based on how easily we can think of an example of it happening before, or how much we have heard about it. 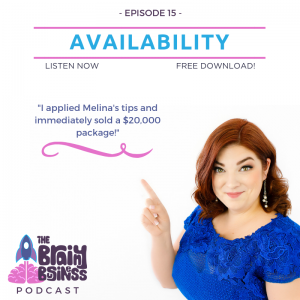 Listen on to hear how these random things work together, and for more interesting examples of this concept and how you can apply them in your business. [06:05] Availability is about how easily something comes to our mind. [06:38] What comes to mind when I say the word shark? [07:32] What comes to mind when I say the word cow? [08:05] Even though, most people are afraid of sharks. There is less than one shark-related death in the US per year, but there are 22 deaths by cow. [09:41] We fear sharks more than other things that actually cause more harm or deaths because of availability. [10:18] The only time we hear about sharks are when they are attacking people. These examples are easy for our brain to remember, and we assume they happen more often than they do. [11:12] Our brains categorize cows as less dangerous. In spite of the actual statistics. [12:07] Daniel Kahneman dedicated chapter 12 of his book to the concept of availability. [13:52] With availability, our brain swaps out questions at hand with questions that we would be more likely able to answer quickly. [14:32] With availability it’s about how easily examples come to mind. [15:31] Personal experiences and examples are more available than statistics. [16:16] Our subconscious brains love stories. [17:56] Your social media strategies should support what you are doing in your business. Use social media to gain a following in other things, not in the platform. [18:37] Do you know what movie increased tourism in Norway in 2014? [19:22] Norway had to cut their tourism budget, because they were overflowing with visitors. [20:49] In 1997, the sales of Mars Bars went up significantly (even though they did not change their advertising at all). This was because of the Mars rover. These are examples of how our brains associate things with each other. [21:47] When it comes to availability in your business, you need to associate your business with things that are going on around you. [22:57] In last week’s episode, I gave examples of scarce items that flew off the shelf (from Starbucks, Disney and more). They were associated with things that were already popular at the time like the color rose gold. [26:10] Currently, a lot of people are talking about Nike and the Kaepernick Campaign. [28:16] In episode 4, I talk about one of my favorite books called A More Beautiful Question. I reference combinatorial thinking, which helps you get more ideas by combining things together that others may not think goes together. Instead of connecting A and B try to connect A and Z (or better yet, A and 26). [29:41] HARO is a website that connects reporters with potential sources. I reach out and respond with my unique perspective (sometimes it might seem random, but that is often better!) and I have been quoted in some articles. [32:38] Last week, I promised to revisit the story of how diamonds became the powerhouse that they are today. Diamonds actually aren’t that rare. Diamond engagement rings didn’t become popular until the 1940s. [35:42] De Beers had to create an illusion that diamonds were forever. [38:24] Young men had to view diamonds as an expression of love. They then used movies and magazines to reinforce this perception about diamonds. They also stressed the size of the diamonds. [40:22] By 1941, the advertising agency was able to increase the sale of diamonds by 55%. The sale was based on an idea of the eternal value of a diamond. [42:53] De Beers and diamonds is the original availability case study. They changed the face of the entire world forever. [43:23] Diamonds became a piece of our culture without us even realizing it. [44:37] They also did solid research into the mindset of the consumer and found new ways to get their message out. [45:23] Watch conversations and look for the right time to interject yourself. The ‘Oprah effect:’ Does everything she touch turn to gold?